The Best Fifth Generation Headphones Set Is Finally Here, Brought To You By G-Fire! Are you a fan of sports and gym but can't imagine working out without your favorite beats to tune your exercises? Have you tried several different earphones and Bluetooth headsets but were disappointed because their sound was awful or your ear canals would be sore after wearing them? Would you like to try a pair of headphones that are durable, waterproof, sweatproof, and will stay put no matter the circumstances? If yes, then this is your lucky day, because we have just the thing for you! Relieve Your Head & Ears From Usual Headphone Soreness! Unlike most conventional headsets, bone conduction earphones don't pressure your ear canals and won't damage your eardrums. What's more, they boast an ergonomic, advanced design and they can be adjusted exactly as you want them around your head, which means that they will fit you perfectly and won't fall off during training! Universal Compatibility & Sleek Design! Not only are your brand new Bluetooth earphones compatible with 90% of the electronic devices in the market, but they are also extremely cool-looking! Use Them For Hours & Hours! The nan-waterproof material ensures that no sweat will damage them, and their long-lasting battery can provide you with up to 8 continuous hours of use - always depending on the volume and frequency of use, of course! Enjoy flexible and soft low frequency, and exquisite high-frequency performance. However, you can also be very well aware of your surroundings, since the headset doesn't muffle everything - talk about many birds with one stone! Place Your Order Immediately & Get Your Own Pair Today! Simply Click "Add To Cart"! ✔️ ENJOY YOUR FAVORITE SONGS WHILE WORKING OUT! 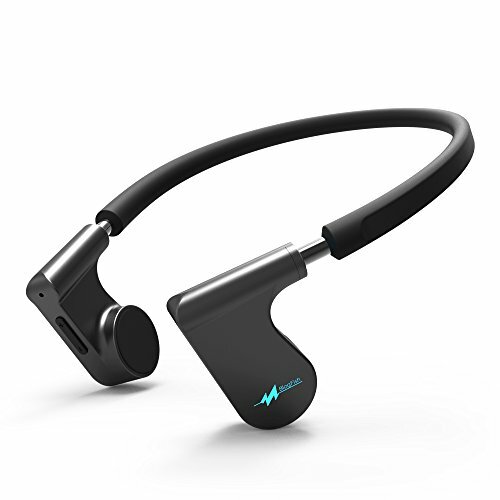 Finally, you can now get rid of messy cables, tangled cords and potentially harmful earphones that put pressure over and in your ears; with this incredible, waterproof and sweatproof G-Fire bone conduction Bluetooth headset you can truly enjoy your training sessions and other outdoor hobbies! ✔️ NO MORE MISSED INCOMING CALLS! Stop fearing that you may miss an important call while you're running, working out, or when you're focused working on your latest DIY project; thanks to the built-in HD microphone and its noise-reduction feature, you can hear your interlocutor as if they were standing next to you! ✔️ EXQUISITE SOUND QUALITY! Enjoy crystal clear sound quality when you're listening to your favorite tunes or responding to phone calls. The headset was designed to have an improved response of input audio identification ability, and an excellent, bass prominent, low- and high-frequency performance, along with thorough and clear IF! ✔️ MADE OF STURDY TITANIUM & FLEXIBLE SILICONE! The sturdy, titanium made skeleton is ultralight, weighing only 55 grs, but super sturdy and durable as well. The skin-soft, in-ear silicone pads are non-slip, non-opaque, hypoallergenic, AND eco-friendly! ✔️ SUPER EASY, ONE-BUTTON OPERATION! No need for complicated instructions or fuss. When it comes to your new headphones' set, all you need to do is switch the key to answering or hanging up your phone, and double-click in order to replay the last call! If you have any questions about this product by Blog.Fish, contact us by completing and submitting the form below. If you are looking for a specif part number, please include it with your message.